There’s an age-old problem when it comes to losing weight. And that is carbs. I am at that stage, four months postpartum, where I have decided that I don’t really want to be just a little bit fat anymore. My daughter is gaining weight and developing the gorgeous chubby thighs and baby cellulite that everyone coos over. But, in reality, if I got my thighs out I would most definitely not get the same reception. 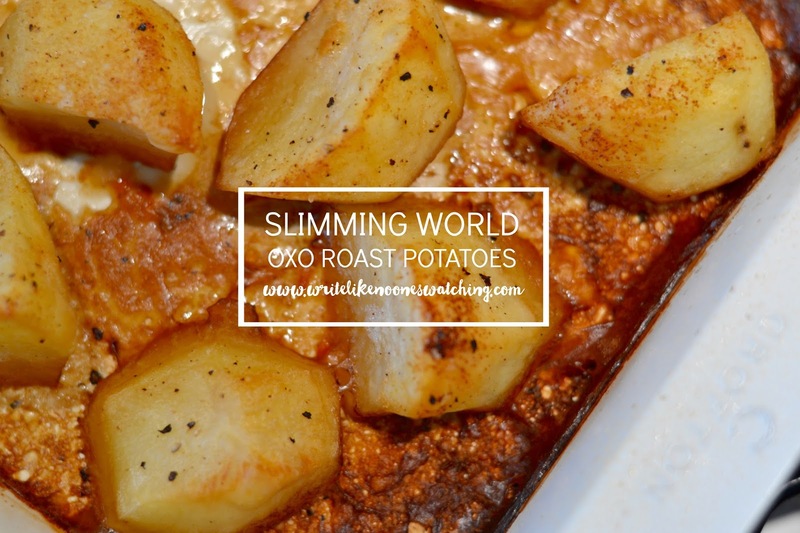 I’ve decided to join Slimming World. Again. I have used the methods and syn-counting before, and made recipes, like this one, before. But this time I am joining a group. But more on that another time. Today, I am here to talk potatoes. It’s almost Sunday Roast season. Let’s face it – Summer is fast-fading and out will come the woolly jumpers, wellies, and roasting joints. And potatoes. Lots and lots of potatoes. Roast potatoes are a weakness of mine. And these are wonderful. You are probably eye-rolling at me, if you haven’t tried them before, but trust me. I know my spuds. The addition of Oxo Cubes are actually not a new thing to me. My Nanna, who is Barnsley-bred, makes hers with Oxo Cubes (and probably fat too – but that’s not happening today) and the flavour is pretty amazing. So let’s make potatoes then. 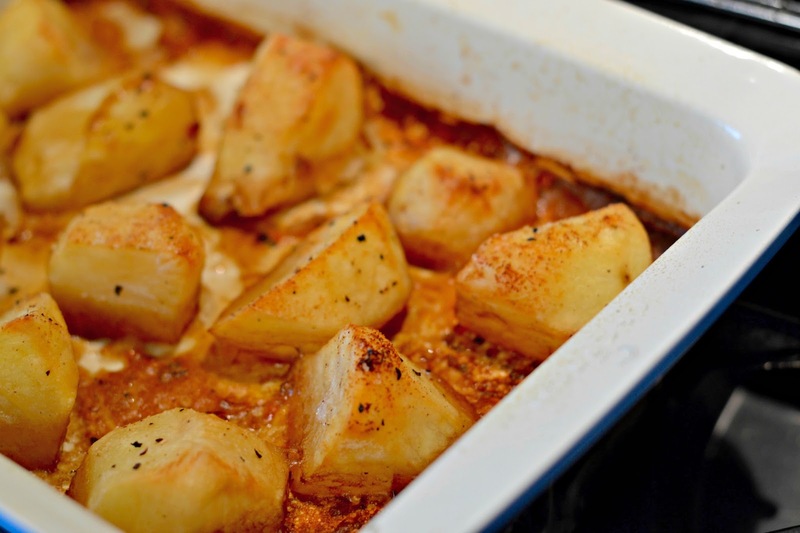 Potatoes – I like Maris Piper for roasties. Two Oxo Cubes – I use the beef ones, but have used with Lamb and Chicken as well. Just go with what suits you best. 300ml Boiled Water (more on this in the method below). Chop your spuds. You can see the size of mine below. I like to use Nigella’s method and not cut directly in half, but at more of an angle as that gives more surface area for optimum crisping. I tend to chop into two, or three depending on the size of the potato. Next step would be to parboil them. But you can also get away with popping them in the microwave for a three to four minutes too, if you are time-poor. This is to get the cooking process started, and fluff up those edges for crisping. Once they are parboiled (you want them just starting to soften on the outside – not done) give them a good old shake in the pan, or even the tray you want to cook them in. This will create little fluffs and scrapes that catch the heat and give you that crispy bite that makes a roastie so darn good. Now, next, you’ll want to boil a kettle and add your two Oxo Cubes to your boiling water in a jug. I used 300ml here, and I made 14 roast potatoes. Now, if you were making more, you would double, and so on. The aim here is to get lovely stock to about halfway up your potatoes. That is important. 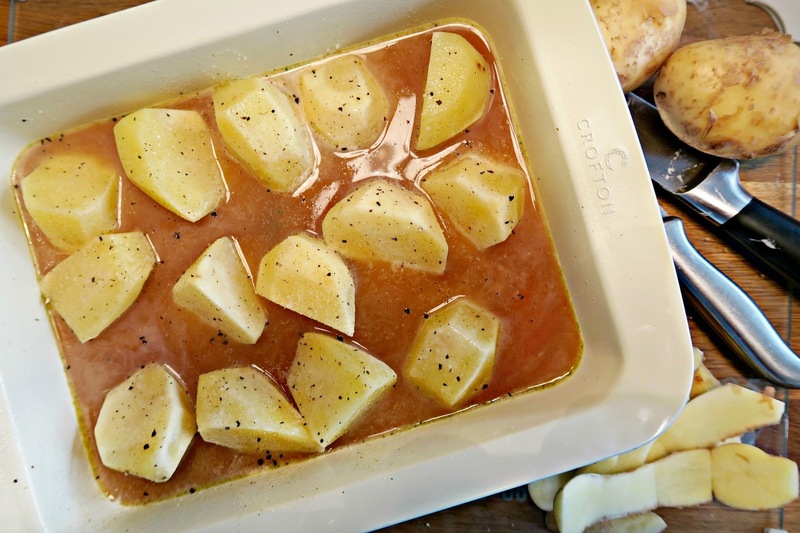 And pour round the potatoes – not over – or you are stopping them from crisping on top. Give the potatoes a good spray with Fry Light (I use the Sunflower Oil one), to help the tops go crispy. What I like to do here is season. Add a sprinkle (very small) of salt (the Oxo Cubes are salty enough really), a crack or two of black pepper, and a dusting of garlic granules. You could also add some garlic loves or rosemary too. But this is optional. Next, pop them in the oven for about an hour to cook. The stock should be fully dissolved and the potatoes crispy and heavy with flavour. Try your best not to ‘try’ one while piping hot as you will melt your mouth off. Previous Post So this is my Mum Bod? Gotta try this recipe, it sounds so good and not hard to make. Thank you for sharing!